First place I've been to in Australia. I liked it so much that I stayed for almost 3 months. This is a small hostel (about 50 people) so the atmosphere is really nice and everybody very friendly ! Most of the people stay there for a long time. 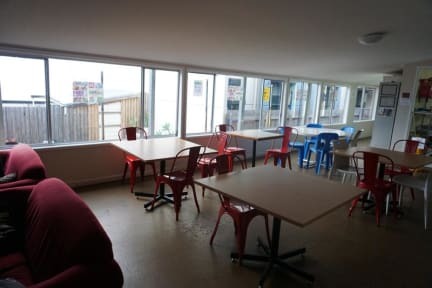 Lots of outside areas to chill, and the reception is next door at the City HQ which means you get more freedom and privacy, it feels more like a big shared house rather than a hostel ! Plus, it is such a good value for money ! Definitely recommend it ! Good hostel, you get what you pay for. Many people here are staying for an extended period of time to work. You get what you pay for. The rooms were unbearably hot though as the fans weren’t very big and did nothing but blow hot air around the room. The kitchen again, small and so hot! The location is perfect though, not far to walk to town or catch transport to other places around Brisbane. Right near a supermarket too, bonus! The Hostel was okay good for its value, kitchen and bathroom was clean enough and rooms didnt feel to hot. However dorm doors were left open and no lockers in the rooms. The place smelt of weed all the time and residents obviously long termers seemed clicky. Staff/cleaners seemed rude but at least the place was kept tidy . The receptionists women from the morning were horrible!! Bad service and rude! Although the night shift was amazing. Wonderful guy. The hostel was okay, but I wouldn’t stay there again. Not the cleanest, not a really nice atmosphere and it does not have its own reception, you have to walk to the neighbouring hostel for all enquireries. The place was dirty + dingy. The showers had mold in them and cockroaches. The dorm room also had cockroaches and I'm pretty sure a mouse because a hole was chewed through my bag + my trail mix, when I got up the next morning . I only stayed the one night, but I wouldn't recommend it.